Copyright: © 2018 Fahimi Z, et al. This is an open-access article distributed under the terms of the Creative Commons Attribution License, which permits unrestricted use, distribution, and reproduction in any medium, provided the original author and source are credited. Background: Atherosclerosis is the main cause of mortality in heart disease patients that its dependence on cholesterol levels has been shown. The side effects of chemical drugs have created a tendency toward medicinal plants for treatment of diseases. Objective: The aim of this study is to evaluate the effect of alcoholic extract of the Alcea angulate on the formation of atherosclerotic plaque due to hypercholesterolemia in rabbit aorta. Methods: 25 male New Zealand white rabbits were divided randomly into 5 groups. Two months respectively treated with basic diet [group 1], basic diet plus 1% cholesterol [control group, group 2], 1% cholesterol with diet intervention Alcea angular at doses of 200, 400 and 800 mg/kg of body weight [groups 3, 4 and 5]. Blood lipid profile levels were measured after 60 days. At the end of the study, the animals were scarified and lipid profile and atherosclerotic plaque formation in the aorta arteries was measured. Data using SPSS ver. 16 were analyzed. Tukey HSD test was used to compare paired groups. Results: Serum levels of total cholesterol and LDL.C of the groups which treated with the Alcea angulata was significantly lower than the control group (p<0.01). Serum levels of HDL in treated groups compared to the control group significantly increased (p<0.01). Pathology studies showed the desired effects and mitigation of extract on the progression of aorta atherosclerosis in hypercholesterolemic rabbits. Conclusion: The overall result demonstrated that use of the Alcea angulate plant reduced total cholesterol and LDL in the blood and inhibited the atherosclerotic plaque formation. Heart disease, especially artery disease, is a leading cause of disability and death in industrialized societies and about one million people lose their lives due to ischemic heart disease annually in America . Several factors are significant in the development of atherosclerosis in aorta artery . Ischemic heart disease (IHD) is the most important markers of atherosclerosis todays. Virtually all patients suffer a heart attack, Myocardial Infarction (MI) and most of the victims with sudden death have had coronary atherosclerosis . Medicinal plants usage to treat diseases have centuries of history and in many developed countries is considered as a primary way of treatment . Many medicinal plants have been identified as an adjunctive therapy in reducing cardiovascular risk factors . Aleca angulata is a plant of the mallow family (Malvacaea), that knows its origin to different parts of Asia and Europe . Hibiscus has been used as a therapeutic plant commonly since ancient times. Mallow has a soothing and calming effects and relieve skin irritation and inflammation  and has been applied for treatment of severe coughs , angina, bronchitis , inflammatory diseases , kidney stones, constipation and tenesmus . Important ingredient of this plant are known such as flavonoids, polyphenols groups [11,12], poly saccharides [9,13], and mucin  and anthocyanins and fiber . These compounds have antioxidant property and free-radical oxygen scavenger and also is consumed as food [15,16]. In clinical studies the effects of antioxidants in improving cardiovascular disease have been reported [17,18]. Malvacaea family consumption is suggested for the treatment of cardiovascular disorders . Since most of the herbal combination, in controlled amounts, have less toxic side effects in comparison with the chemicals ones, in this study effects of Malvacaea family was assessed in preventing the formation of Atherosclerotic plaques in rabbit aorta. Pointy marshmallow plants (Aleca angulate) was collected in mid-September from different areas of Ilam province and was identified and confirmed by the Research Center for Agriculture and Natural Resources of Ilam. After being dried in the shade away from direct sunlight and moisture and grinding into powder, was stored inside the bags until extraction. 150 grams of powder was inserted in ml 1000 ethanol (70%) and extraction operation was carried out by Soxhlet apparatus for 18-12 hours. Extract was concentrated by solvent removal device, transferred into clean glassy container and was placed in the oven at 40°C for 24 hours to dry extract obtained. The resulting powder was resolved in an appropriate solution (distilled water) and was used in a proper dosage. 25 adult male rabbits of New Zealand race with an average weight of 1.8-2.4 kg were used. The rabbits were purchased from Razi Institute of Karaj. In order to adapt to new circumstances, rabbits were kept for two weeks in appropriate temperature, humidity and lightening (12 hours of darkness and 12 hours of light) in randomly and then were treated. The Rabbit were feed with Standard grain ready (pellet) of the Dame Pars company, containing 15% protein, 50-40% carbohydrate, 2% fat and 15 to 25 percent plant fiber. All animals in the experiment had access to enough food and water. The protocol of all experiments was approved in advance by the Ilam University of Medical Sciences Ethics Committee and performed in accordance with NIH guidelines for care and use of laboratory animals (ir.medilam.rec.1396.93). After habituation period for two weeks, the rabbits were randomly divided into 5 groups of 5 as follow: First group received a normal diet (non-hypercholesterolemic); Second group (hypercholesterolemic diet) as control group; Third group, hypercholesterolemic diet + stem hibiscus extract (200 mg/kg); Forth group, hypercholesterolemic diet + stem hibiscus extract (400 mg/kg); Fifth group, hypercholesterolemic diet + stem hibiscus extract (800 mg/kg). To prepare a 1% cholesterol diet, one gram of cholesterol (Merck) was solved in some olive oil (2 cc) and rabbits were force feeded (gavage) with it as high cholesterol diet. The study was conducted over a 60-day period that continued until the animals reached the ideal weight. After that animal were anesthetized, rabbits heart and vascular were removed and fixed in formalin (10%). histological sections were prepared and examined under a microscope. Measurement of serum cholesterol, high-density lipoprotein (HDL), low-density lipoprotein (LDL) and triglycerides (TG) all are done with spectrophotometric method (enzymatic colorimetry). The low-density lipoprotein cholesterol (LDL.C) also was calculated using Friedewald formula: [LDL.C (mg/dl) = TC - (HDL.C + TG/5)] . At the end of the biochemical experiments (60 days), rabbit sacrificed under chloroform (overdose) and their aorta artery was isolated and fixed in formalin (10%) taken sections from the aorta were stained with Hematoxylin and eosin . Using an optical microscope aorta artery wall changes were evaluated. The results of microscopic observations based on the frequency and severity of lesions were graded from 0-4. Zero grade: no lesion, first grade: Plaque thickness less than the thickness of the media, mild forms of endothelial dysfunction, second grade: Media thickness half the thickness of plaque in the presence of macrophages and smooth muscle cells within the plaque, Third grade: thickness of plaque equal Media thickness and plenty of connective tissue within the plaque that represents the synthesis and proliferation of extracellular matrix by smooth muscle cells. Fourth grade: thickness of plaque greater than the media thickness, large lipid core plaque which fully raised the surface of endothelial . Normal distribution of data was evaluated with Kolomogrov- Smirnov test in both groups. Statistical differences were determined using ANOVA. Tukey HSD test was used to compare paired groups. Statistical significance was defined at P<0.05. Using SPSS ver. 16 Data were analyzed. The results showed that the rate of serum cholesterol in hypercholesterolemic rabbits treated with alcoholic extract of hibiscus stem (doses of 200, 400 and 800 mg/kg) significantly reduced compared to the control group (p<0.001) (Figure 1A). Extract of hibiscus stem significantly decreased he serum LDL in hypercholesterolemic rabbits compared to the control group (p<0.001) (Figure 1B). The results also demonsterated a significant increase in serum HDL in hypercholesterolemic rabbits treated with alcoholic extract of marshmallow compared to the control group (p<0.001) (Figure 1C). Consumption of alcoholic extract stem Aleca didn’t show any changes in the serum VLDL hypercholesterolemic rabbits treated with doses of 200 and 400 mg/kg compared to control group but at dose of 800 mg/kg this parameter decreased compared to the control group (p<0.001) (Figure 1D). The consumption of alcoholic extract in doses of 400 and 800 mg resulted in a significant decrease in serum TG levels compared to the control group (p<0.05) (Figure 1E). Figure 1: Comparison of serum cholesterol(A), HDL(B), LDL(C), VLDL(D), TG(E) levels in the control group (hyper cholesterol) versus groups treated with alcoholic extract of marshmallow extract at doses of 200, 400 and 800 mg/kg of body weight. The histological results showed that in the normal diet group vessels were completely normal and no lesion in the vessels intima and media observed (Figure 2). aortic plaque were detectable in the sections prepared from the group treated with cholesterol-1%, Lipid-laden macrophage shave produced Foamy cells, smooth muscle cells were seen in these plaques and Plaque thicknesses had been increased (Figures 3A, 3B and 5). 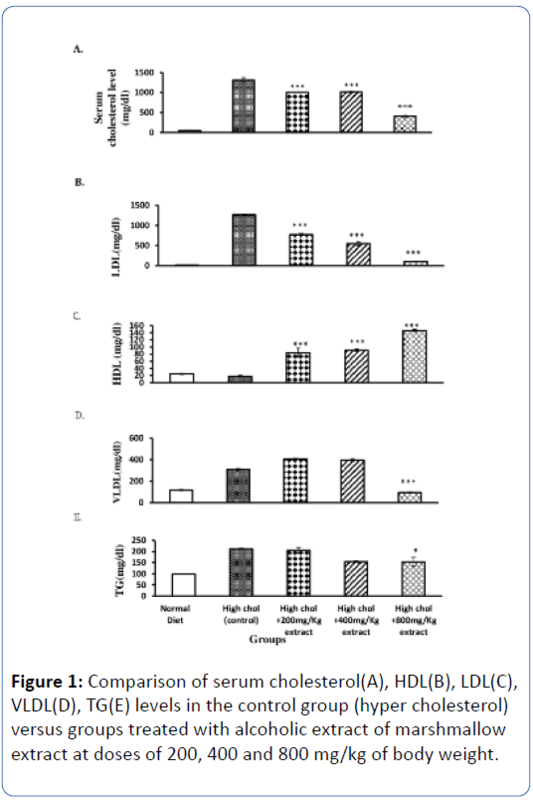 Consumption of hibiscus extract with hyper cholesterol diet decreased the severity of lesions compared to hyper cholesterol group significantly so that at dose of 800 mg/kg of hibiscus extract complication was limited just to formation of very few macrophages in intimal layer (Figures 4 and 5). 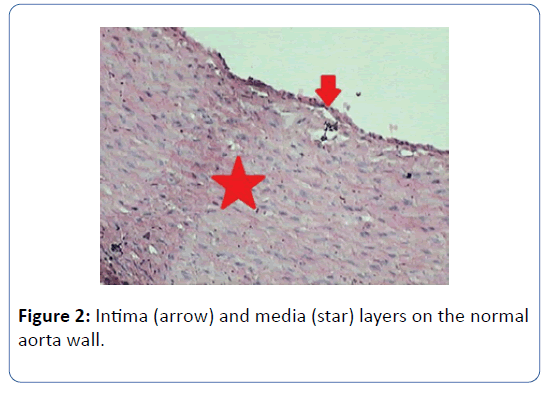 Figure 2: Intima (arrow) and media (star) layers on the normal aorta wall. 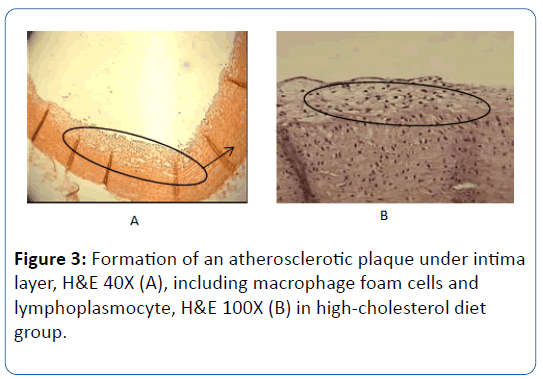 Figure 3: Formation of an atherosclerotic plaque under intima layer, H&E 40X (A), including macrophage foam cells and lymphoplasmocyte, H&E 100X (B) in high-cholesterol diet group. 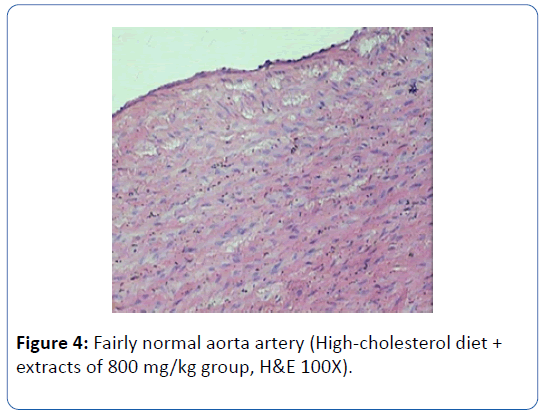 Figure 4: Fairly normal aorta artery (High-cholesterol diet + extracts of 800 mg/kg group, H&E 100X). 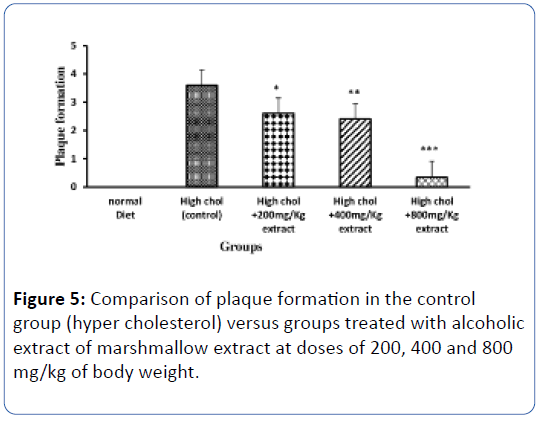 Figure 5: Comparison of plaque formation in the control group (hyper cholesterol) versus groups treated with alcoholic extract of marshmallow extract at doses of 200, 400 and 800 mg/kg of body weight. This study showed that cholesterol-rich diet increased total cholesterol, triglycerides, LDL and VLDL respectively. Similar changes in these parameters have already been reported by other studies . This diet created also a significant decrease in HDL concentration. Ramirez et al. (1999) reported that using of cholesterol-1% for 7 weeks caused creation of fatty streak in rabbit aorta and ultimately atherosclerosis . In this study, consumption of a diet with 1% cholesterol for 60 days has been able to establish plaques. In present study, three doses of alcoholic extract of aerial parts of the stems and angular hollyhock Aleca angulate (200, 400 and 800 mg/kg) in the form of gavage for 60 days in hyperlipidemic rabbit, in addition to reducing cholesterol and LDL levels (P<0.01) also increased HDL level compared to the control group significantly (P<0.01)and these changes were in a dose dependent manner. This study demonstrated a reduction in the aorta artery wall lesion in the rabbits which treated with alcoholic extract of marshmallow to greatly was compared to high cholesterol diet ones. Extent of the impairment in the group that had consumed the hibiscus extract at a dose of 800 mg/kg was limited to establishment of foamy cells in a very small amount into the vessel intima, while in the rabbits with rich cholesterol diet fully raised thromatous plaques in the vessel were seen. Studies suggest that consumption of a diet rich in fruits and vegetables caused a significant decrease in cardiovascular disease . These diets contain compounds such as antioxidants . Positive effects of consumption of foods containing antioxidants in improving cardiovascular disease have been reported in clinical researches . Antioxidants are able to prevent free radical damage resulting from the oxidation of LDL cholesterol, so can blockage atherosclerosis and platelet adhesion which leads to thrombosis and inhibit their risk of heart disease or stroke . Yamakoshi et al. reported that the use of plant extracts Malvaseh family for 8 weeks in hypercholesterolemic rabbits decreased Serum cholesterol and LDL-C respectively by 14% and 17%, but did not have much effect on HDL-C and triglycerides  that partly consistent with our research results. In another study Chen and colleagues observed that administration of the extract of Hibiscus sabdariffa (Plant of the family Malvash) in hypercholesterolemia rabbits decreased cholesterol by 28%, LDL-C and triglycerides by 53 and 55% respectively . Hibiscus sabdariffa extract inhibits LDL oxidation in vitro  and this extract has the property of lowering cholesterol level. Researchers also showed that this plant extract prevents the progression of atherosclerosis [30,31]. Studies have shown that Hibiscus sabdariffa extract prevented migration of smooth muscle cells resulting in thickening of the arteries in hypercholesterolemic rabbits. The results of this study are consistent with our research findings. Direct role of free radicals in the development and progression of atherosclerosis, suggests antioxidants as influential factors in preventing of progression of the disease. There are numerous reports about antioxidant property of the species of hibiscus extract . Flavonoids by enhancing the LDL receptors and increase catabolism of LDL in the liver have reduced serum cholesterol levels . Hibiscus extract mechanism in reducing atherosclerosis can be due to presence of flavonoids. Hibiscus root extract like other herbal extracts contains compounds with abundant biological effects. Sabu et al. reported Green tea polyphenols inhibit lipid peroxidation and superoxide radicals in diabetic rats . Hibiscus plants like green tea plant is belong to the Malvaceae family. These plants as well as plants that contain flavanols and isoflavonols have vascular protective effects . Studies have shown that hibiscus is useful in the treatment of inflammatory diseases . In other hand it has been shown that atherosclerosis is an inflammatory disease . Regard to the effect of inflammation in the progression of atherosclerosis, anti-sclerotic property of marshmallow may be due to their antiinflammatory effect. Taken together the results obtained in this study have shown that alcoholic extracts of the stem and aerial parts of hibiscus reduced serum cholesterol level and LDL.C and inhibits atherosclerosis plaques appropriately. The results of this study and previous researches show that hibiscus extract could be considered as complement drug for the treatment and prevention of complications of atherosclerotic plaque in human. The work was financially supported by the research vice chancellor of the Ilam University of Medical Sciences (Grant no: 901004.53). McIntosh HD (1989) Risk factors for cardiovascular disease and death: A clinical perspective. J Am Coll Cardiol 14: 24-30. Belamarich P, Deckelbaum R (1990) Hypercholesterolemia in children. Drug Ther 20: 41. Sindambiwe J, Calomme M, Cos P, Totte J, Pieters L, et al. (1999) Screening of seven selected Rwandan medicinal plants for antimicrobial and antiviral activities. J Ethnopharmacol 65: 71-77. Vijaimohan K, Jainu M, Sabitha K, Subramaniyam S, Anandhan C, et al. (2006) Beneficial effects of alpha linolenic acid rich flaxseed oil on growth performance and hepatic cholesterol metabolism in high fat diet fed rats. Life Sci 79: 448-54. Batooli H (2002) Medicinal industrial and aromatic plants of kashan, national symposium of medicinal plants. Kashan research center of agriculture, natural sources, arid area and desert: 88-9. Association BHM (1996) British herbal pharmacopoeia 1996. Bournemouth: British Herbal Medicine Association: 212. Sutovska M, Nosalova G, Sutovsky J, Franova S, Prisenznakova L, et al. (2009) Possible mechanisms of dose-dependent cough suppressive effect of althaea officinalis rhamnogalacturonan in guinea pigs test system. Int J Biol Macromol 45: 27-32. Mirhidar H (2002) Encyclopedia of plant, practical in preventing and treatment of illness. Tehran: Nashr va Farhang Islami :111-115. Sutovska M, Nosalova G, Franova S, Kardosova A (2006) The antitussive activity of polysaccharides from althaea officinalis l., var. robusta, arctium lappa l., var. herkules, and prunus persica l., batsch. Bratisl Lek Listy 108: 93-9. Zargari A (1995) Medicinal plants: Tehrari University Publications. Bradley P (1992) British herbal compendium: A handbook of scientific information on widely used plant drugs/published by the British Herbal Medicine Association and produced by its Scientific Committee. Bournemouth, Dorset: The Association. Razavi M (2003) Medicinal plant. Tehran: Tealash Pub: 104. Kardosova A, Machova E (2006) Antioxidant activity of medicinal plant polysaccharides. Fitoterapia 77: 367-373. Pakravan M, Abedinzadeh H, Safaeepur J (2007) Comparative studies of mucilage cells in different organs in some species of Malva, Althaea and Alcea. Pak J Biol Sci 10: 2603-2605. Bohm H, Boeing H, Hempel J, Raab B, Kroke A (1998) Flavonols, flavone and anthocyanins as anthocyanins as natural antioxidants of food and their possible role in the prevention of chronic diseases. Z Ernahrungswiss.37: 147-163. Espín JC, Soler-Rivas C, Wichers HJ, García-Viguera C (2000) Anthocyanin-based natural colorants: A new source of antiradical activity for foodstuff. J Agric Food Chem 48: 1588-1592. Mennen LI, Sapinho D, de Bree A, Arnault N, Bertrais S, et al. (2004) Consumption of foods rich in flavonoids is related to a decreased cardiovascular risk in apparently healthy French women. J Nutr 134 :923-926. Yokozawa T, Ishida A, Cho E, Nakagawa T (2003) The effects of Coptidis Rhizoma extract on a hypercholesterolemic animal model. Phytomedicine 10: 17-22. Sharma U (1994) Cure of heart diseases with ayurvedic drugs. Sachitra Ayurved 47: 95-96. Noori Mogahi SMH, Heidari Z (2006) Applied methods and terminoligy of histotchicque, stereology & morphometry: Tehran university of medical sciences: 497. Chekanov VS (2003) Low frequency electrical impulses reduce atherosclerosis in cholesterol fed rabbits. Med Sci Monit 9: 302-309. Prasad K (1999) Reduction of serum cholesterol and hypercholesterolemic atherosclerosis in rabbits by secoisolariciresinol diglucoside isolated from flaxseed. Circulation 99: 1355-1362. RamÃÂ±rez-Tortosa M, Mesa M, Aguilera M, Quiles J, Baro L, et al. (1999) Oral administration of a turmeric extract inhibits LDL oxidation and has hypocholesterolemic effects in rabbits with experimental atherosclerosis. Atherosclerosis 147: 371-378. Anderson JW, Smith BM, Gustafson NJ (1994) Health benefits and practical aspects of high-fiber diets. Am J Clin Nut 59: 1242-1247. Ramirez-Tortosa C, Andersen ØM, Gardner PT, Morrice PC, Wood SG, et al. (2001) Anthocyanin-rich extract decreases indices of lipid peroxidation and DNA damage in vitamin E-depleted rats. Free Radic Biol Med 31: 1033-1037. Lakenbrink C, Lapczynski S, Maiwald B, Engelhardt UH (2000) Flavonoids and other polyphenols in consumer brews of tea and other caffeinated beverages. J Agricfood Chem 48: 2848-2852. Yamakoshi J, Kataoka S, Koga T, Ariga T (1999) Proanthocyanidin-rich extract from grape seeds attenuates the development of aortic atherosclerosis in cholesterol-fed rabbits. Atherosclerosis 142: 139-149. Chen CC, Hsu JD, Wang SF, Chiang HC, Yang MY, et al. (2003) Hibiscus sabdariffa extract inhibits the development of atherosclerosis in cholesterol-fed rabbits. 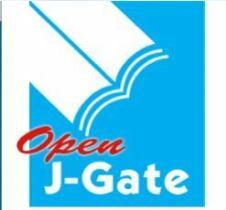 J Agric Food Chem 51: 5472-5477. Chen CC, Chou FP, Ho YC, Lin WL, Wang CP, et al. (2004) Inhibitory effects of Hibiscus sabdariffa L extract on lowÃ¢ÂÂdensity lipoprotein oxidation and antiÃ¢ÂÂhyperlipidemia in fructoseÃ¢ÂÂfed and cholesterolÃ¢ÂÂfed rats. J Sci Food Agric 84: 1989-1996. Sheela C, Kumud K, Augusti K (1995) Anti-diabetic effects of onion and garlic sulfoxide amino acids in rats. Planta Med 61: 356-357. Ahmed R, Sharma S (1997) Biochemical studies on combined effects of garlic [allium sativum linn) and ginger [zingiber officinale rosc) in albino rats. Indian J Exp Biol 35: 841-843. Nakagawa T, Nozaki S, Nishida M, Yakub JM, Tomiyama Y, et al. (1998) Oxidized LDL increases and interferon-γ decreases expression of cd36 in human monocyte–derived macrophages. Arterioscler Thromb Vasc Boil 18: 1350-1357. Sabu M, Smitha K, Kuttan R (2002) Anti-diabetic activity of green tea polyphenols and their role in reducing oxidative stress in experimental diabetes. J Ethnopharmacol 83: 109-116. Motamedifar M, Darbari M (2005) Effect of aqueous, alcoholic and chloroform extracts of German Chamomile (Matricaria Recutita) on some gram-positive and gram-negative bacteria. Indian J Med Res 3: 39-46.